The 2030 Agenda is a universal, collective responsibility that covers all levels: global, national and territorial. To address global policy challenges in a complex and interconnected world, policy coherence will be key. 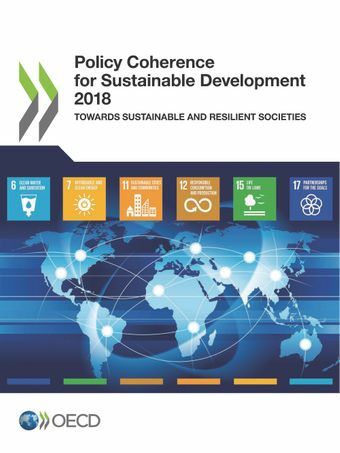 A more coherent multilateral system will be essential to reconcile and deliver the economic, social and environmental transformations needed to achieve the Sustainable Development Goals (SDGs).The 2018 edition of Policy Coherence for Sustainable Development shows how integrated and coherent policies, supported by strong institutional mechanisms, can contribute to the “Transformation towards sustainable and resilient societies” – the theme of the 2018 United Nations High-level Political Forum (HLPF). The report applies the institutional, analytical and monitoring elements of the “policy coherence for sustainable development” framework to identify challenges and opportunities facing governments as they move to implement the SDGs, both at the national level and collectively at the global level.The report suggests eight building blocks for enhancing policy coherence for sustainable development (SDG Target 17.14), and identifies emerging good institutional practices drawing on recent OECD work, country surveys and voluntary national reviews. It includes 19 country profiles and sets out options for tracking progress on policy coherence for sustainable development at the national level.